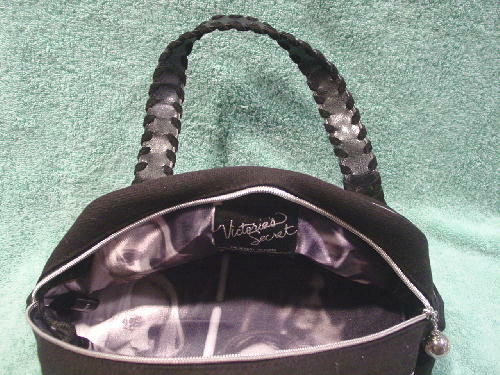 This never-used black fabric handbag is by Victoria's Secret (The Sexiest on Earth). 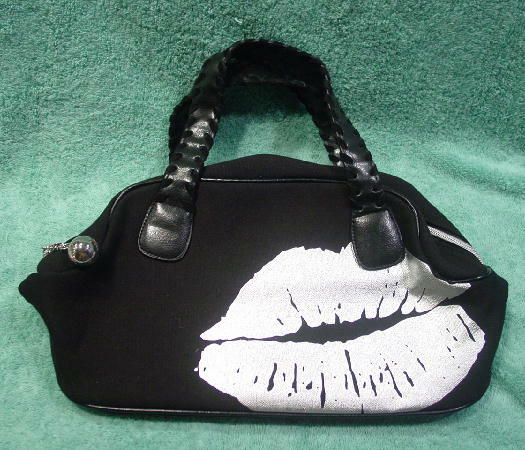 It has faux leather handles with woven sides. On the front are silver lame lips. There is a top side to side silver zippered opening with a small chain and heavy metal ball-shaped pull with Victoria's Secret etched on it in two places. The fabric lining has black and white pictures of two of the models. There is a hard fabric-covered removable bottom. The fabric tag says body material 100% cotton, trim material 100% PVC, lining 100% polyester - color of the bag may transfer to light colored clothes.